takes great pride in her accomplishments as a teacher, choreographer and performer. Her many years of training, and the long hours spent every day in studio practice have resulted in a deeply motivated Artistic Director. As a child, growing up in New York City, she had the marvelous opportunity of studying with the finest ballet, jazz and tap teachers that city had to offer. Among these are names such as Maria Swoboda, of the Ballet Russe de Monte Carlo; Selia Dubroskay, and Muriel Stuart of the School of American Ballet, under the direction of George Balanchine; internationally-known jazz teachers Matt Mattox and Luigi; John Mattison, choreographer for MGM and 20th Century Fox Film studios. During her performing career, she toured with such celebrities as Sammy Davis, Tony Bennett, Eydie Gorme, Steve Lawrence, Peggy Lee and Johnny Mathis. Marcia was honored with coverage as “teacher-choreographer deserving of national attention” by “Dance Magazine” (the largest publication of its kind in the world). She began choreographing the Miss New Jersey Pageant in 1970, and from 1975 through 1995 held the title of Producer/Choreographer for our state pageant. In 1972, Marcia became the first female Assistant Choreographer of the internationally televised “Miss America Pageant”…and assisted Tony-Award winner Peter Gennaro (Choreographer of Broadway’s “Annie”). She also assisted Scott Salmon for five years (Choreographer of Broadway’s “La Cage Aux Folles”). 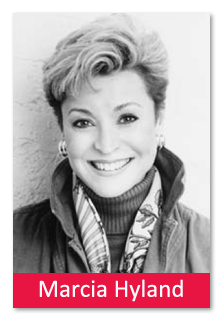 Marcia served as Staff Choreographer for the Miss America Pageant for twenty-five years. The Pageant now enjoys a world-wide audience in excess of 300 million. Marcia Hyland incorporates her immensely varied background of theatre, dance and music in her teaching technique. This marvelous technique has been available to professional teachers and students in the tri-state area through her “Master Dance Workshop Classes.” She also taught a series of special scholarship and enrichment classes at Rowan State College. The program was funded by the State of New Jersey School of the Arts. After being appointed by Mayor Susan Bass Levin, Marcia served as a member of the Cherry Hill Arts Advisory Board for seven years, and has also been honored with the cover and feature story of “New Jersey Woman” publication. Another credit Marcia Hyland is extremely proud of is her appointment to choreograph and stage production numbers for the “Gillette Corporation’s London-Paris Industrial Show.” Her successful staging of numerous industrial shows for the Gillette, Pillsbury and Clairol Corporations has contributed toward making her the highly regarded teacher/choreographer that she is.